A Buyer who worries about asking price is missing the bigger picture of how to negotiate the purchase of a home. The methods used to determine asking price on any given property are so wildly varied as to defy clear definition. Especially as emotion plays such a large part in the ultimate decision. In this market, in my opinion, the Buyer should set their own price. A Buyer who worries while shopping about asking price and list price is missing the bigger picture of how to negotiate the [tag]purchase of a home[/tag]. The [tag]Realtor[/tag] doesn’t control you—and you should never let them, either! 1. Create your wish list for the home you want. 2. Identify the neighborhood(s) you like. 3. Get out there and shop, shop, shop (that means: do NOT sit at home looking at internet listings; all you’re seeing are ADVERTISEMENTS, not homes). 4. Being out there you gather personal data to compare/contrast against your wish list. 5. Being out there you develop your own personal “gut-feeling” of [tag]market price[/tag]. 6. Make offers. That’s how you, the Buyer, determine the market price. (btw: I gave the SAME advice during the boom). If a Seller is unrealistic, you will walk away from the [tag]house[/tag] because no amount of patient negotiating is going to convince that Seller of the “true” market price. This isn’t rocket science: it’s just patience and a realistic appraisal of the market for [tag]home buying[/tag]. Previous Previous post: Everything That Was OLD is NEW again. 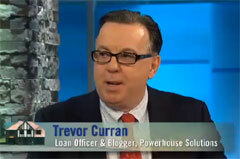 In this episode of Destination Home, Trevor shares the top five mistakes people make when purchasing a home. Check out the video for his insights into each. Thoughts and information on mortgages, home buying and real estate. This site is for informational purposes only and is not meant to solicit or advertise mortgage services.